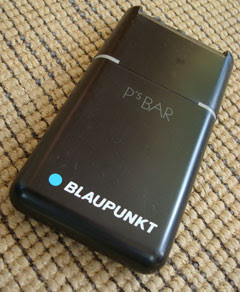 In 1987, Blaupunkt, a German car stereo company, ran this ad in several national magazines in the USA. 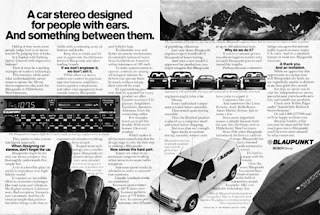 Problem: the mountains pictured in the ad had this caption: "The mountains of Europe are just one of the obstacles Blaupunkts engineers have had to overcome to improve radio reception." Reason that was a problem? The pictured mountains are the most-photographed mountains in all of North America - the Maroon Bells of Colorado. I sent them a letter pointing out that error - and they sent me a pen set as a "token of our thanks for your alertness". 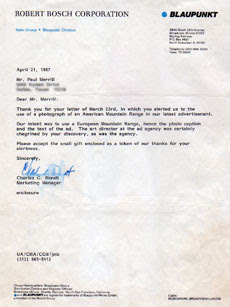 An amusing part of the letter was this: "The art director at the ad agency was certainly chagrined by your discovery, as was the ad agency." You must have been very alert and observant to have discovered that. Not easy at all. You always have been keen to see those things and you do deserve a "token of thanks for your alertness". Remember the game of tag?